Becoming Nana By Julianne Glatz for the Illinois Times – a great piece about becoming a grandma through adoption. Also wonderful, because Julianne’s daughter is breastfeeding the adopted baby and Julianne brags about it as a proud grandma! Yes, adoptive breastfeeding is possible and awesome!! The Incredible Shrinking Baby – The Baker’s Dozen is a blog I started following after the recommendation of a friend (thanks, Sarah!). The mom is a photographer and writes about the daily life in their family with 14 kids (5 adopted). I had to share this post because it’s so cute – a little photo essay of their baby, Apollo, eating a banana. Study Linking Vaccine to Autism Was Fraud, Journal Reports – NY Times. This was caused a stir earlier in the week, and started a great discussion with two of my friends and me on Facebook (which I sort of abandoned because I got busy). I’m going to write more on the topic of vaccines and our family next week. TV: Minimizing the Damage – Alternative Mama had a great post this week about TV and kids. We’re in the camp that doesn’t even own a TV, but her post is a little bit more moderate. Why Chinese Mothers Are Superior by Amy Chua – The Wall Street Journal. An interesting piece about “Chinese” parenting and why Chua thinks it’s better to berate and hound children into academic and musical perfection, because “nothing is fun until you’re good at it.” Oh yeah, and they should never have sleepovers or play-dates or have a part in the school play. There’s a follow-up article, Retreat of the ‘Tiger Mother’ on the NY Times, where she attempts to explain away the incredibly harsh and cruel picture that she painted of herself. OK, I’m not going to read the “Chinese” parenting piece because the comment “nothing is fun until you’re good at it” goes against so many things I hold important… true, there are SOME things that are less enjoyable when you are brand new to them than when you have more experience, but once you get over that initial hurdle the “fun” is in the gradual unfolding and exploration. 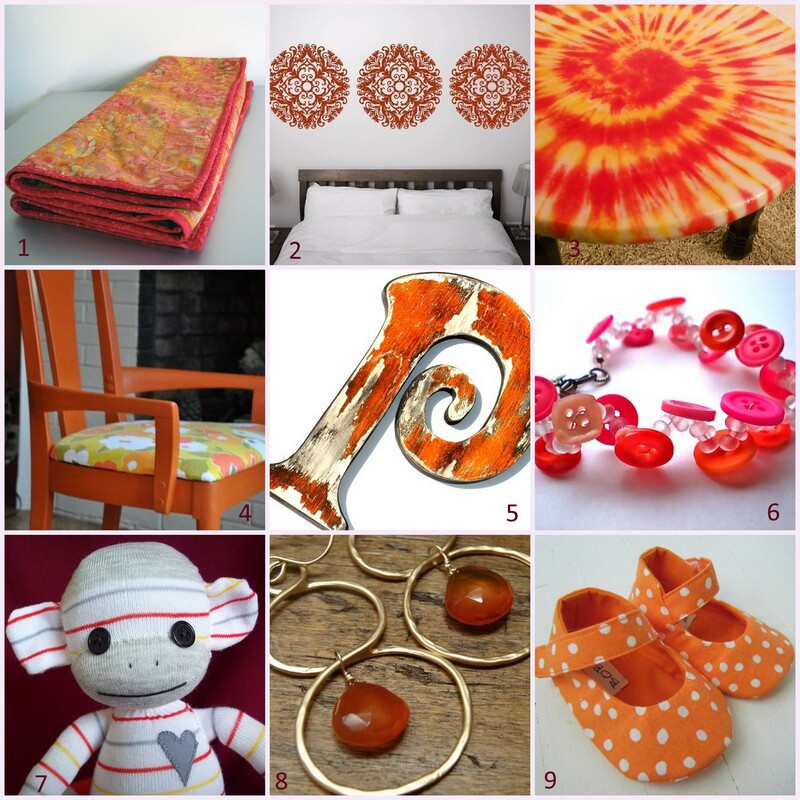 And i’m LOVING the etsy-love, I ADORE orange at the moment.